Search.nw-cmf.com is the PUP that uses misleading techniques to prevent removal. Use Reimage to locate malicious components and get rid of them faster than with uninstall instructions. A full system scan blocks virus reappearance and prevents traffic to malicious domains. Search.nw-cmf.com by SaferBrowser - should you use this search engine? How can one install this hijacker on a computer system? Search.nw-cmf.com by SaferBrowser – should you use this search engine? Search.nw-cmf.com virus belongs to browser hijacker category due to its ability to infiltrate user’s computer system silently and alter particular browser settings without the user’s knowledge or authorization. The only good thing is that this potentially unwanted program (PUP) does not belong to malware category, which means that it does not initiate any malicious activities. However, this program has a dubious reputation and can definitely open paths to insecure Internet sites, so it is advisable to remove Search.nw-cmf.com hijacker from the system without delay. If your PC has been compromised by this program, you definitely know what it does. It promotes the SaferBrowser search engine that is placed on Search.nw-cmf.com site, which it sets as the new homepage, new tab page, and default search engine domain. Although it seems that it delivers Yahoo search results, it actually delivers SaferBrowser Yahoo search results, which are entirely different. Be very careful with this search tool and better do not enter any personal information while browsing websites you access via it; otherwise, this hijacker might collect it and use it for marketing purposes. Although it claims to be receiving only personally non-identifiable information, particular data such as your search queries can contain such info. On top of that, it can figure out what is your IP address, what websites did you visit, what ads did you click on recently and more. The hijacker is interested in such information because it seeks to deliver targeted advertisements to you, so it pays attention to your search queries and other information to figure out what kind of content can attract your attention and make you click on it. These ads can show up next to organic search results delivered by Search.nw-cmf.com search engine, or be displayed in pop-up windows or new tabs. The indicated ads can lead you to dangerous websites, so be careful! According to the developer of this browser hijacker, users should mind general Internet hazards and remember that “any time they receive files over the Internet from third parties, regardless of the application used […] email or other application, they may be subjecting themselves to receiving harmful files.” This statement gives us an idea that this search engine can lead you to dangerous websites; therefore, we believe that you should not trust such search tool. We believe that it is better to remove Search.nw-cmf.com redirect virus and use a more trustworthy search tool instead. 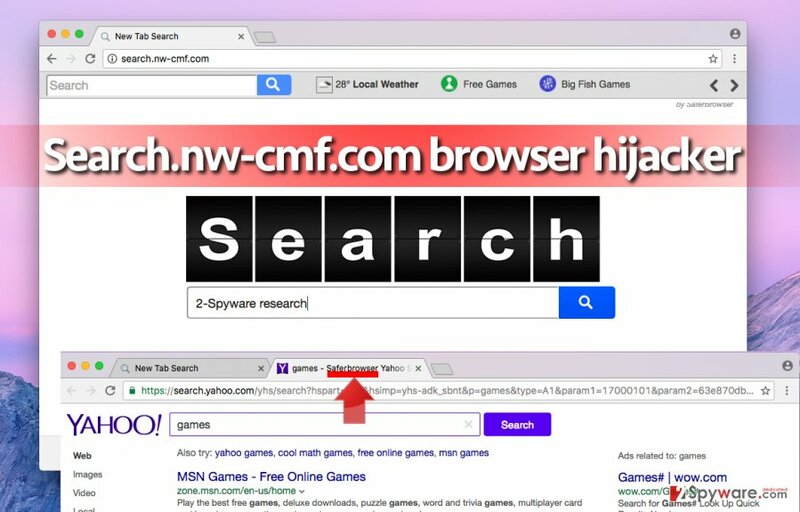 Browser hijackers like Search.nw-cmf.com hijack systems when installed by inattentive computer users along with freeware or shareware. To install a potentially unwanted program unknowingly, it is enough to install certain software using Default or Standard settings, which seem trustworthy at first sight. In reality, they conceal statements allowing to install third-party software alongside your downloaded program. If you do not want to install vague third-party programs, you should refuse to get them before clicking that “Install” button. Therefore, you should select Custom or Advanced settings and alter components of your download manually. Perform this check every time you download a free program from the Internet to avoid installing spyware or malware type programs unknowingly. Do not let this browser hijacker reside in your computer any longer – remove Search.nw-cmf.com virus right now. You can do that by using a reputable anti-malware application like Reimage or manually. To forget about annoying redirects and browser slowdowns, use Search.nw-cmf.com removal instructions that are presented below. If you encounter any problems or if you cannot uninstall this program, feel free to contact our support team. Find SaferBrowser and other suspicious-looking programs and uninstall them. You should also remove all programs published by SaferBrowser, too. Then proceed to instructions that explain how to clean up infected web browsers and follow them carefully. Here, look for Search.nw-cmf.com or any other recently installed suspicious programs. Remove all applications related to, or developed by SaferBrowser. Wait until you see Applications folder and look for Search.nw-cmf.com or any other suspicious programs on it. Now right click on every of such entries and select Move to Trash. When in the new window, check Delete personal settings and select Reset again to complete Search.nw-cmf.com removal. Once these steps are finished, Search.nw-cmf.com should be removed from your Microsoft Edge browser. Here, select Search.nw-cmf.com and other questionable plugins. Click Remove to delete these entries. Now you will see Reset Firefox to its default state message with Reset Firefox button. Click this button for several times and complete Search.nw-cmf.com removal. Here, select Search.nw-cmf.com and other malicious plugins and select trash icon to delete these entries. Click Reset to confirm this action and complete Search.nw-cmf.com removal. Here, select Extensions and look for Search.nw-cmf.com or other suspicious entries. Click on the Uninstall button to get rid each of them. Here, look at the Homepage field. If it was altered by Search.nw-cmf.com, remove unwanted link and enter the one that you want to use for your searches. Remember to include the "http://" before typing in the address of the page. Now you will see a detailed dialog window filled with reset options. All of those options are usually checked, but you can specify which of them you want to reset. Click the Reset button to complete Search.nw-cmf.com removal process. This entry was posted on 2016-11-10 at 07:35 and is filed under Stealing programs, Viruses. You can quickly scan the QR code with your mobile device and have Search.nw-cmf.com virus manual removal instructions right in your pocket. How did you remove Search.nw-cmf.com virus?